Although people have used music to maintain and improve health for centuries, music therapy is still a relatively young profession. Formally recognized in the 1940s following use with soldiers returning from World War II, the profession has developed and had its interventions tested ever since. Like any medical field, it is necessary to understand why interventions have an impact and to develop procedures so that these techniques can be used with all clients. Additionally, The Arts in Psychotherapy, The Journal of Hospice and Palliative Nursing, Frontiers In Integrative Neuroscience and others, have reported music therapy research findings. This has led to increased awareness of potential benefits. The number of Cochrane reviews – the research community’s “gold standard” – have also increased. All music therapists must complete research and statistics courses as part of their training. This encourages more well-designed studies by professionals. Since my work at Masonic Villages focuses on older adults, I will highlight some recent music therapy research that shows music therapy’s impact on seniors. Neurologic Music Therapy (NMT) uses specific rhythms and techniques to prime desired responses. NMT-trained music therapists may utilize Rhythmic Auditory Stimulation to help regulate gait (walking pattern). They may use Vocal Intonation Therapy and Rhythmic Speech Cueing to improve a patient’s ability to speak clearly. These areas positively impact patients with Parkinson’s disease or those recovering from strokes. Music therapy research also shows its effectiveness in decreasing anxiety for individuals with dementia. It also provides meaningful ways to connect through creating interactive music. In fact, research has shown that even when individuals lose the ability to speak, they can sometimes communicate through song. Music stimulates multiple areas in the brain. This makes it possible to develop new neural pathways to compensate for losses. In end-of-life care, music therapy provides a way to complete a meaningful life review, creating a product for patients to leave their loved ones. It also helps manage symptoms, including pain and anxiety, with fewer medications. As we understand more about the power of music when used intentionally to address clients’ goals, our field grows. I am proud to work for an organization committed to that growth, and to understanding new techniques to improve our residents’ quality of life. 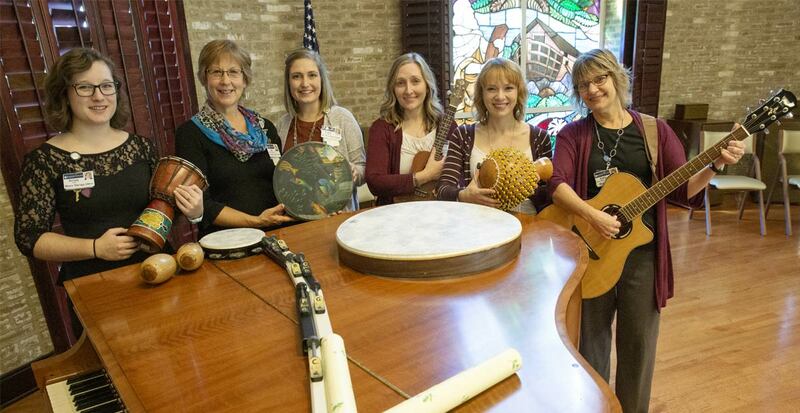 Liz Eargle, Recreation/Music Therapist at Masonic Village at Elizabethtown (second from right), received her bachelor’s degree in Music Therapy at Elizabethtown College in 2012 after an internship at CarePartners Hospice in Asheville, North Carolina. A board-certified music therapist since 2013, she completed her master’s degree in Music Therapy at Temple University in 2018.